Microsoft Office has been the standard for office software for decades. Its core programs, Word, Excel, and Powerpoint are the cornerstone businesses around the world. With over 1.2 billion users worldwide, Microsoft Office is the most popular office suite. With Microsoft Office 2019, there’s enhancements and new features to make it even better than before. Office 2019 Standard improves the performance of all the core programs. New features include improved inking across all apps (multi-touch support), advanced graphic tools, improvements to PowerPoint editing features, more formulas and better data analysis with Excel, and improved cloud integration across all documents that supports better sharing capabilities with real-time team editing features. 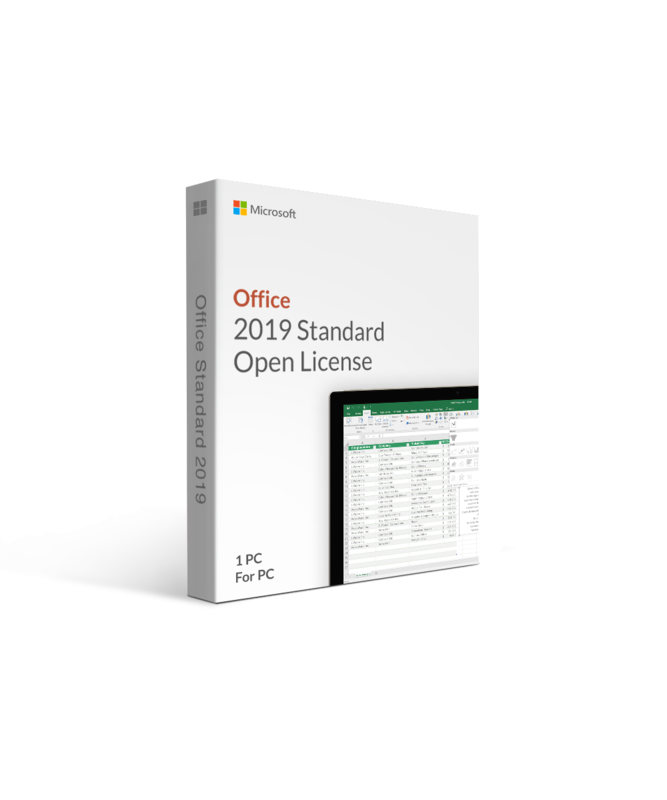 Office 2019 Standard Edition gives you the Office programs you need to create stunning professional presentations, documents, and complex spreadsheets. Office 2019 STandard also comes with Outlook, which features a more focused inbox, better ways to sort your emails, and new improvements for more efficiency in managing your contacts and email. If you use Microsoft Surface devices, you are no doubt a fan of the digital pen that lets you draw, write notes, and doodle directly onto their device’s screen. Office 2019 brings you new inking capabilities across all apps, including pressure sensitivity, tilt effects that adjust the ink’s thickness, and a roaming pencil case that lets users store and organize their favorite pens, pencils, and highlighters for use with all devices. For data management and analysis, Excel is still the spreadsheet of choice. Excel 2019 brings in more powerful features like new formulas, new charts (like funnel charts and 2D maps), the ability to publish from Excel to Power BI (Microsoft’s own business analytics service), and enhancements for PowerPivot and PowerQuery. Office Standard 2019 is ideal for home users, students, or even small business owners who don’t need all the features of Office Professional. Save money, stay focused, and enjoy all the benefits of Microsoft Office. With Office Standard 2019, you can create, present, communicate, and publish professional-looking documents with time-saving features, a new look, and built-in collaboration tools. Save your work in the cloud on OneDrive and access it from anywhere. If you’re looking for the best office suite available, Microsoft Office 2019 has it all. €370.39 | In Stock Want it Now? Order and receive your download instantly.